I say good writer because, let us be clear at the outset, that is finally the fundamental factor in having a successful book or books: on some level, the book must be reasonably well-done. It is important that we never forget that. Yet there are plenty of good books out there — written by excellent writers, some of whom are friends I met in the capacity of book-editor — that just don’t sell, and the reason for this is that there is a formula (of sorts) to the process, a formula that requires a business mind, as opposed to artistic, and this, I believe, is where many writers founder. Writers, as you know, are not, in the main, salespeople. I’m certainly no exception to this — which is one of the many ways you can be sure this post isn’t a pitch. The following, rather, the first in a series, is a documentation of a recent, eight-month-long experiment I’ve been conducting, which if you’re a writer or are interested in being a writer you’ll find, I think, reasonably liberating. When my first book came out, Kindle was barely in her infancy. When my second book came out, Kindle was still a baby. At that time, neither my publisher (and friend), who’s now retired, nor I knew anything significant about Kindle, and it turns out that we did about everything wrong — or, at any rate, not quite right. 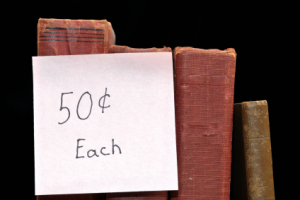 Platforms, so-called, are virtually meaningless when it comes to selling books. And for writers looking to sell books, platform-building is a colossal waste of time. Twitter followers, Facebook friends, website subscribers, email lists — none of these things sell books. That position is heterodox, and it’s contrary to everything you’ve been taught, I realize, and yet it’s unequivocally true. I know whereof I speak: in my life, I’ve set-up and run seven different websites, all of which have been successful to one degree or another — two of them wildly so, in the sense that these website have gotten plenty of traffic and have had excellent readerships. Yet the amount of book sales that this traffic generated was, to say the least of it, poor. The overwhelming majority of the books that I’ve sold have come through hand-selling.